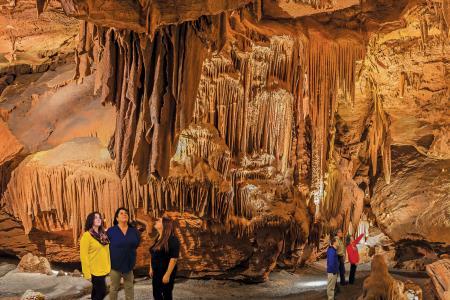 There’s no denying that venturing beneath the Luray Virginia caves and caverns can bring out the explorer in all of us. We may know that the paths have been walked hundreds and thousands of times, but that doesn't stop us from craning our necks and trying to catch a glimpse of something new or special, something the others in our group may not have noticed. The kid inside of us comes alive as the adventure begins beneath the surface and you let your imagination run wild with thoughts of what it would have been like to be the first explorers of the high-ceilinged halls. The Shenandoah Valley lays claim to numerous caverns, each with different features than the one before it. 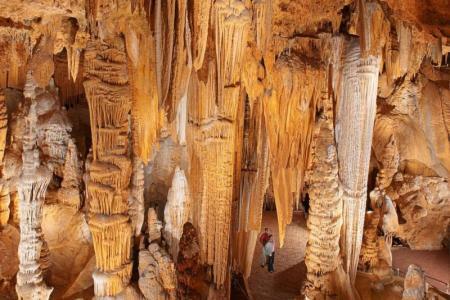 Luray Caverns and Shenandoah Caverns are both known for the limestone rock that permeates the soil in western Virginia, this rock is susceptible to water carving paths and caves into it over the course of thousands of years. If you've ever wanted to know what you’re walking on; what wonders reside below the ground’s surface; what treasures nature has hidden below our roadways, walking paths, and local buildings, you have to make at least one of Shenandoah Valley's numerous caverns a destination during your next visit! Eastern America's largest and most popular caverns. U.S. Natural Landmark. Explore cathedral-size rooms with ceilings 10 stories high. Only cavern in Virginia with elevator service, allowing explorers of all ages to discover the underground world.